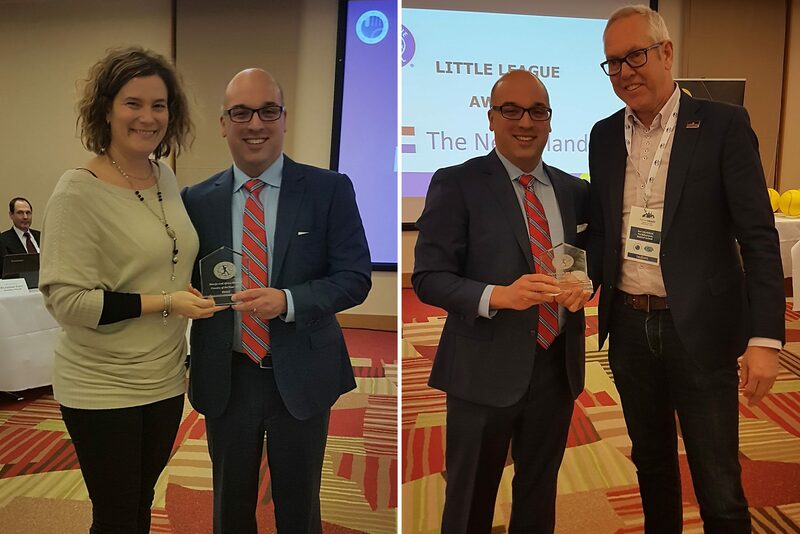 Italy (left) and Netherlands receive the 2017 Little League Europe and Africa Baseball and Softball Countries of the Year Awards. In recognition of their dedicated support and success in the growth of the Little League® Baseball and Softball program, Italy and the Netherlands were named the 2017 Little League Europe and Africa Baseball and Softball Countries of the Year, respectively, at the join Confederation of European Baseball and European Softball Federation Ordinary Congress in Paris on Saturday, February 10. Recipient of the 2017 Baseball Country of the Year, Italy offers the opportunity for young boys and girls all throughout the country to participate in the Little League program and has seen continued growth and success over recent years. A sign of their recent success, Emilia Little League has earned a spot as the representative of the Europe and Africa Region at the Little League Baseball® World Series in Williamsport, Pa., for the last two years and in 2017, a team from Emilia/Romagna Little Leagues represented the Europe and Africa Region at the Senior League Baseball World Series in Easley, S.C.
Named the 2017 Softball Country of the Year, the Netherlands offers nation-wide opportunities to participate in the Little League program in coordination with the Royal Netherlands Baseball and Softball Federation (KNBSB). Over the years, the Netherlands has continued to grow its participation in Little League’s regional tournaments and clinics and in 2017 hosted the Junior and Senior League Softball Europe and Africa Regional Tournament as well as a Little League softball coaches’ clinic. Each June, the Netherlands also host national tournaments for baseball and softball in one location to help attract parents and spectators to gain interest in the Little League program, and have developed a strong volunteer base that includes a number of umpires that have served at both Regional and World Series tournaments. In 2017, the Netherlands softball talent was on display as a team from District 1 represented the Europe and Africa Region at both the Junior and Senior League Softball World Series. Among those representing their European countries was Virmidas Neverauskas, the father of former Little League graduate and current Pittsburgh Pirates pitcher Dovydas Neverauskas, who was in attendance as the representative of the Lithuanian Baseball Federation. As a Little League coach himself, Mr. Neverauskas has been instrumental in the growth of Little League throughout Lithuania and has brought a number of teams to the Europe and Africa Region Tournament in Kutno, Poland, over the years. “Little League games at California District 68, California District 57, and the European Regional tournament in Kutno were the biggest motives and stimulus for Dovydas on the road to Major League Baseball,” said Mr. Neverauskas about his son’s Little League experience. A member of the Lithuania Vilinius Little League team that was the Europe and Africa Region runner up in 2004, Dovydas returned to Kutno in 2007 where he helped lead his team to win the Regional tournament and earn a spot at the Senior League Baseball World Series. In 2017, Dovydas had the opportunity to make history and bring his Little League career full circle as he joined the Pittsburgh Pirates on a trip to Williamsport for the MLB Little League Classic on August 20.